Road fatalities from accidents with heavy goods vehicles are decreasing, but Volvo Trucks research shows that the same reduction is not being seen in accidents involving cyclists and pedestrians. Actions are needed to reduce these accidents. New technology combined with updated legislation, better infrastructure, higher safety awareness and improved visibility can make our city traffic safer. Around the world, cities are growing as three million people move to urban areas every week. “Cities bring people together, but with so many people and vehicles sharing the same space, pedestrians and cyclists suffer a large number of the serious traffic injuries and fatalities. This issue needs to be tackled on a wide front through both technology and collaboration,” said Carl Johan Almqvist, Traffic & Product Safety Director at Volvo Trucks. Volvo Trucks has made safety one of its core values during its 90-year history and takes a multi-faceted approach to traffic safety. Traffic safety awareness programmes such as Volvo Trucks’ ‘See and Be Seen’ initiative, targeted to children and cyclists, is another important part of the work. Now many cities are choosing to tackle the challenge on a broad front as well. Dozens of major cities worldwide have taken a ‘vision zero’ approach to traffic injuries. In London, for example, the city’s transport authority, Transport for London (TfL), aims to have zero serious injuries and fatalities on its roads and that 80 percent of all Londoners’ trips be made by foot, by cycle or using public transport by 2041. One major initiative underway by TfL is to develop the world’s first Direct Vision Standard (DVS) for heavy goods vehicles in the city. Under the draft proposal, all heavy-goods vehicles over 12-tonnes will need to demonstrate high levels of direct vision from the cab, or other equivalent safety measures, to operate in London from 2020. “This is the ultimate vehicle to maximise direct vision because as a driver you are almost at eye-level with cyclists and pedestrians on the road,” added Claes Avedal, Safety Manager at Volvo Trucks. Trucks operating in cities are also set to get safer through better technology to detect vulnerable road users around the vehicle. 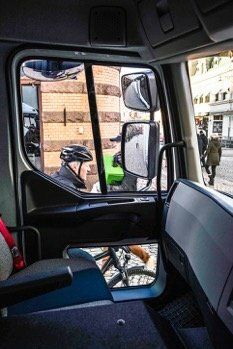 In the EU-funded Xcycle project, Volvo Trucks is co-operating with tech companies and research institutes and one of the technologies involves a detection system for cyclists. “Almost 40 percent of accidents between trucks and cyclists are on the passenger-side of the vehicle. It is the most critical area during a passenger-side turn. In the Xcycle project we want to find out how we can reduce these types of accidents by combining in-vehicle detection systems and the intelligent traffic system in the city using WiFi. Both the truck driver and the cyclist would receive a warning to alert them of hazardous situations,” says Xcycle Project Manager, Jerome Vigneron at Volvo Trucks.